When it comes to taking care of their own health, women are as conscious as men are and wish to own a fit and toned body and lead a healthy life. If you too are amongst such women, then it becomes very important for you to exercise regularly, eat the right kind of foods and stay fit and energized. Though heavy weight lifting and strenuous exercises are said to be a man’s cup of tea, there are many exercises which are made exclusively for women. 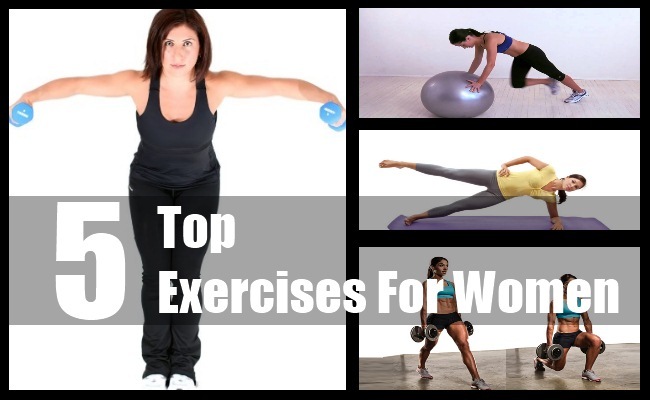 The 5 top exercises for women have been mentioned below and can help her achieve a great figure. This is one of the best exercises for women as it helps her to get flat abs in no time. Get in the push up position and keep your arms absolutely straight. However, instead of keeping your arms on the floor, keep them on the swiss ball. Try to form a completely straight line from top to bottom and tighten your cores well.Hold this position and slowly lift the left foot from the floor, raising your knee towards your chest. Do not change the back posture. Repeat 10 times. When done, perform this exercise with the right foot. Another great exercise for women; it helps to tighten the back muscles and also prevents any stress on the lower back. Lie down on a mat on the floor with your feet flat and knees bent. Keeping your arms on straight on the sides, squeeze your buttocks and raise your hips as much as you can so that you form a completely straight line starting from the shoulders, right till the knees.Hold this position for 5 seconds ensuring that you keep your buttocks tight. When done, return to the starting position. Repeat 8 to 10 times. Yet another great exercise for women, it helps to tighten the hips and abs. Hold a dumbbell in your left hand right next to the shoulder and keep your arms slightly bent. Take a step forward with the left leg and lower down the entire body so that the left knee gets bent to a minimum of 90 degrees with the right knee almost touching the floor. Go back to the normal position. Perform 10 such repetitions and then do the same exercise with the other side. This exercise helps a woman to shape her calves. Place the left foot’s ball on a step and cross the other foot right behind the ankle. Grasp onto something for support. The back should be arched in a natural manner as you bend the hips and lower down your torso so much that the upper body becomes parallel to the ground.Lift the heels as much as possible. Hold for 2 seconds and then lower them down. Repeat 10 to 12 times. When done, perform the exercise with the other leg. This exercise works out the chest and triceps in a woman’s body. 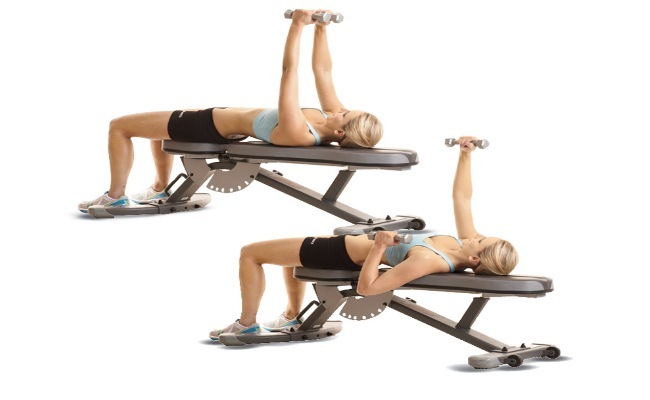 Hold a dumbbell in the left hand while lying down on a flat bench on your back. Keep your arms straight and hold the dumbbell right over the chest area. The palms should face out. Keep your right hand on the abs and slowly lower down the dumbbell on your chest’s side. Hold for 2 seconds and go back to normal position. Repeat 8 to 10 times and then perform the exercise with the other side.